Somebody should have recorded the sound of the crowd following the first encore. 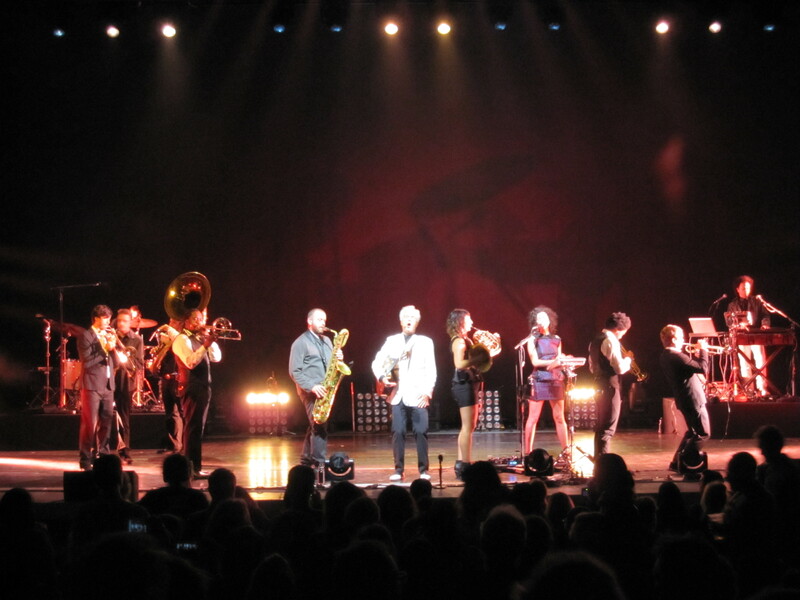 I think that would best express what happened when David Byrne, St. Vincent, and their phenomenal brass band performed at The Greek Theatre Saturday night. In fact, if that’s all you heard about the show – the sound of the audience as it concluded – that should be enough to get you to seek out a time and a place to catch this tour. David Byrne and St. Vincent took the notion of a “concert” and created something so unique it shouldn’t be classified. It was more like a spectacular dream than anything else you’d have experienced musically. The evening unfolded, surprising and unique, every step of the way. It’d probably serve you best not to seek out the videos captured on cell phones, the set list, nor look at photos posted on Instagram. Even if you come away thinking you know what this show is about, you won’t know until you experience it. It’s so special that I’m only going to share bits and pieces. From the moment the audience entered the amphitheater, they were part of the experience, before the “show” began. This provided the opportunity to transition out of the day, beyond traffic, parking, the world at large, and into “the night” (as interpreted by David Byrne and St. Vincent). The songs danced in harmony with the voices in my head. We’re not alone in this world, especially when you consider the beautiful absurdity of it all. Annie Clark (“St. Vincent”) is phenomenal. The one woman in the audience who was encouraging people to sit down was sorely outnumbered. She eventually stood up. This is a show that’s worth paying more for, in order to have seats closer to the stage. You can always watch the video monitors, but you’re going to want to see their feet. Byrne and Clark don’t appear to perform music. Music appears to perform them. You can see every note winding its way through each of them. The music takes form inside of them, before it’s articulated into sound externally. There are certain tones in music that hit corresponding points in the body. You can feel the notes move through you and understand how they move through Byrne and Clark. It’s a two-way conversation, this David Byrne/St. Vincent show. If you’ve been listening to their album, Love This Giant, this show’s arrangement will be an additional treat for you. This entry was posted in Greek Theater LA and tagged Annie Clark, concert, David Byrne, Greek Theatre, horns, live music, music, St. Vincent, Tour.